Our initial idea was to produce copper nanoparticles (NPs) directly in the cell by reducing Cu(II) ions inside the periplasm of Escherichia coli after successful accumulation. This idea seemed plausible since multiple organisms are reported to be able to produce copper NPs naturally. We were more than surprised that the exact mechanism of how copper NPs are formed inside biological systems is not known. We then started thinking about modifying the Mercury(II) reductase (MerA) for producing elemental copper from Cu(II) ions but remodelling multiple active centers of a protein seemed to complex and time consuming at this point and we decided to work with ferritin instead. This was a good decision and ferritin turned out to be the perfect protein for our project. Ferritins are iron storage proteins, able to form NPs. During our project, we worked with the bacterioferritin BfrB from E. coli and the human ferritin HuHF. Ferritins can mineralize iron by oxidizing soluable Fe(II)-ions to Fe(III)-ions, which form oxides and become insoluable. Through this, ferritins offer the ability to form nanoparticles of certain size. Fe(III) and Fe(II) are important cofactors used in the active sites of a broad range of enzymes. Therefore, the iron homeostasis is a process tightly controlled in all organisms. Metal ions can also have toxic side effects when the amount of free ions inside the cell is too high. This is due to copper and iron ions catalysing the formation of reactive oxygen species (ROS) which are highly toxic to the cell. Therefore, we measured the toxicity of different ion concentrations and searched for countermeasures (see Toxicity). To prohibit toxic side effects the efflux and influx of ions are tightly controlled by a set of regulators, importers, exporters and storage proteins. Iron ions are stored in ferritin and ferritin-like proteins. Bacteria like Escherichia coli have ferritin (FtnA) as well as bacterioferritin proteins (BfrB). These proteins can mineralize iron by oxidizing soluble Fe(II)-ions to Fe(III)-ions which form oxides and become insoluble. The Ferric uptake regulator (fur) controls the expression of ferritins and several proteins used in iron mineralization and mobilization. In the presence of sufficient iron, fur is activated by binding Fe(II)-ions and blocks further expression of iron acquisition proteins. In a low-iron environment, the ions get desorbed and fur is inactivated allowing expression of iron uptake proteins. While fur negatively regulates expression, a siRNA (ryhB), which is also negatively regulated by fur, is used as a second level of regulation. The siRNA is transcribed in absence of fur and regulates the expression of iron storage proteins. So in a high-iron environment fur is active and ryhB is inactive so iron-storage proteins like FtnA can be produced. In a low-iron environment, the expression of iron-storage proteins is stopped. Instead, the absence of Fur allows the cell to produce proteins needed for iron mobilization, namely the Ferredoxin reductase (Fpr) and the bacterioferritin-associated Ferredoxin (Bfd). It was shown that Fpr, Bfd and nicotinamide adenine dinucleotide phosphate (NADPH) are needed to mobilize Fe(II) from BfrB, while only Fpr and NADPH are needed for the iron-mobilisation from FtnA. FtnA is a homo 24mer with an iron-oxidase center and a mineralization center at each monomer. BfrB coordinates a heme-iron complex between two subunits, leading to 12 heme complexes in each BfrB protein complex. Ferritins are used in vitro for the production of different nanoparticles composed of AgS, CuS or AuS. Another application is the extraction of phosphate from water. (Jacobs et al., 2010) Additionally mobilizing great amounts of iron ions at the same time could potentially be used to kill cells. Like bacterioferritin and bacterial ferritin, human ferritin consists of 24 four-helix bundles, which self-assemble to form a hollow and spherical protein (Figure 1). 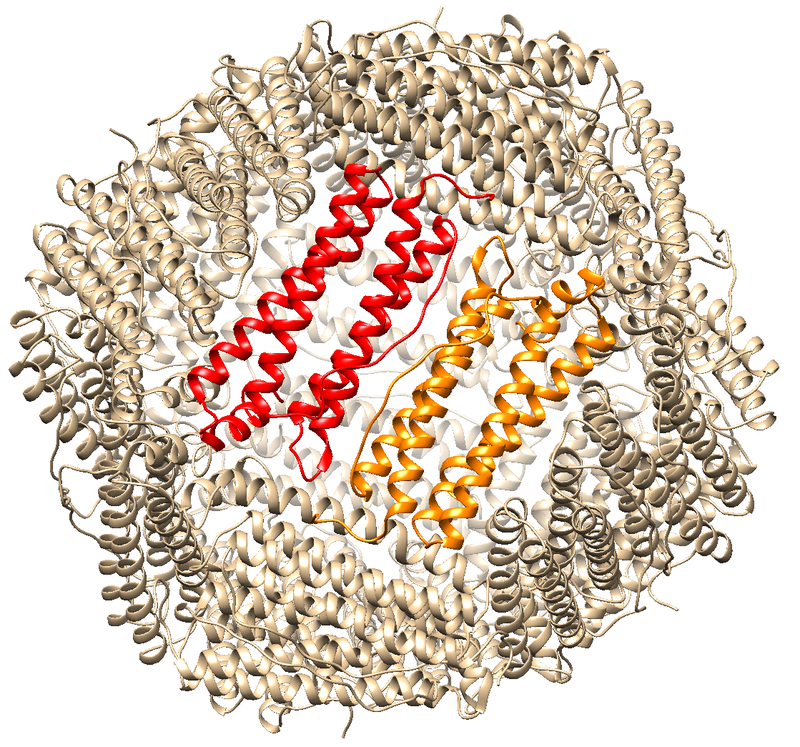 The assembled ferritin consists of bundles which are either heavy or light chains. It is approximately 500 kDa big with an inner diameter of 8 nm and an outer diameter of 12 nm.  Up to 4500 atoms can be stored in its cavity. Pores in the shell allow the diffusion of iron ions into the interior of the ferritin (Briat & Lobréaux, 1997; Butts et al., 2008; Pozzi et al., 2015). Figure 1: Protein structure of the human ferritin wild-type. The protein structure was generated with Chimera (Pettersen et al., 2004). The loading of the ferritin starts with Fe(II) state ions passing through the pores into the ferritin. In the cavity of the ferritin, the Fe(II) state ions are oxidized to Fe(III) state ions by fero oxidoreductase activity of the ferritin subunits. Thus, biomineralization of Fe(III) state ions takes place at the inner surface of the ferritin (Briat & Lobréaux, 1997). During the release of iron ions of the ferritins cavity, the Fe(III) ions are reduced again into Fe(II) ions. These are released from the crystalline structures and attract oxygen atoms. Thus, the ions become soluble and can leave the interior of the ferritin through the pores (Casiday & Frey, 2000). 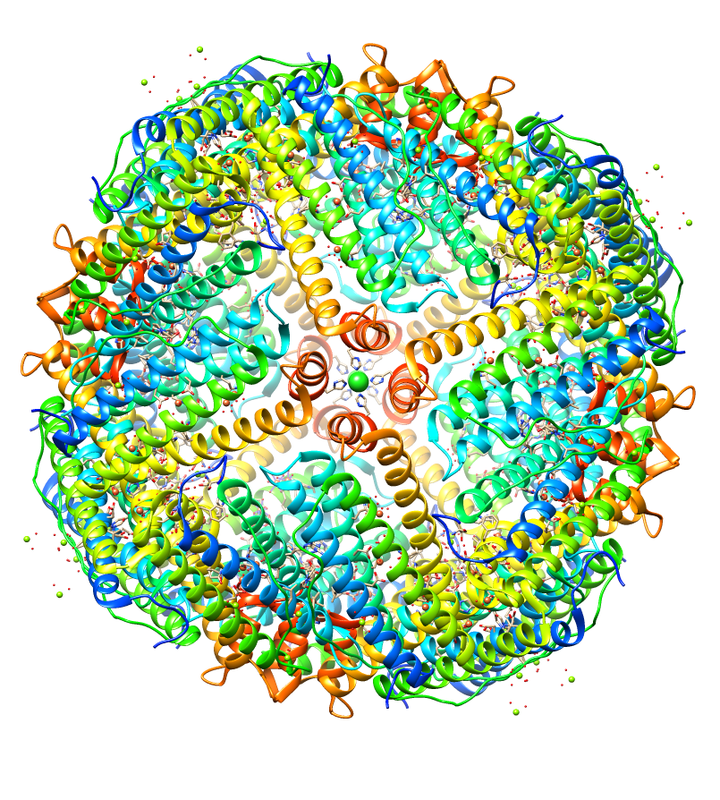 Human ferritin can not only form iron nanoparticles, but also nanoparticles of e.g. 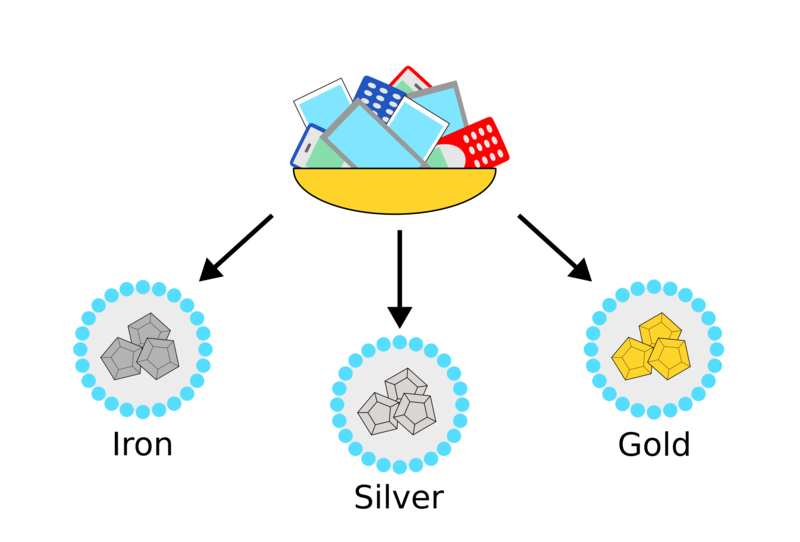 gold or silver ions(Butts et al., 2008). This makes human ferritin suitable for the recycling of valuable metal ions (Figure 2). However, a disadvantage of the wild-type is that nanoparticles are also formed on the outside of the protein shell. Therefore, we introduce an improved human ferritin, which is optimized to form nanoparticles mainly in the inside of the ferritin and has a higher affinity for gold and silver ions. Figure 2: Ferritin is suitable for metal recycling, since it can form e.g. iron, silver and gold nanoparticles in its cavity. Besides being a natural iron storage protein ferritin is used extensively in the field of bionanotechnology. Especially the unique ability of ferritin to self-assemble into a sphere made up of 24 subunits can be exploited to engineer versatile nanocages with singular functional properties. Figure 3: Fully assembled ferritin consisting of 24 subunits with two adjacent subunits coloured in red and orange. With a pH stable range of 3.40−10.0 for ferritin that doesn't contain an iron core also known as apoferritin, a pH range of 2.10−10.0 for ferritin with a ferrihydrite core and a heat stability of around 80°C (Chen, 2016) ferritin is an exceptionally stable protein. The high thermostability of ferritin allows for the employment of simple heat based purification protocols making extraction quick, cheap and simple. Changing the pH is a frequently used method to achieve assembly and disassembly of the ferritin nanocage. However, using strong acids to disassemble the ferritin limits the range of possible proteins and molecules that can be enclosed (Chen, 2016). By using advanced modelling software and established protein engineering principles ferritin can be redesigned and modified to customize the pH range at which dis- and reassembly occur opening up new applications in the field of medicine, nano- and biotechnology. We set out to improve ferritin as a versatile container for the enclosure of proteins and molecules by predicting and modeling multiple mutations affecting the stability of the ferritin cage. Subsequently we implemented the modeled mutations and investigated their effect on ferritin stability. To enhance the stability we incorporated copper ion binding sites in the binding region between ferritin subunits which also increases ferritins performance in filtering valuable resources out of mining water, while simultaneously reducing the toxic copper ion load of the water and inside the cell.